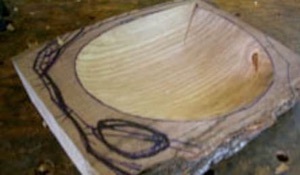 Thirteen bowls were crafted in 2007. All were hand-carved from air-dried Mississippi sassafras that had been sawed into full log width planks (with bark remaining) about 2-1/2 inches thick and 3-4 feet in length. This wood was originally procured about ten years ago from my friend Jack Herring for use as seats for rustic Windsor chairs. * Some of these planks were more than 24 inches wide, which is very unusual for sassafras. They were all sawed from a giant stump that Jack found in the woods. Because some of the original heartwood had decayed, some planks have a weathered hollow at the pith that adds to the visual attraction of the wood. These hollowed planks would be unsuitable for chair seats, but turned out to be inspirational as bowl carving blanks. 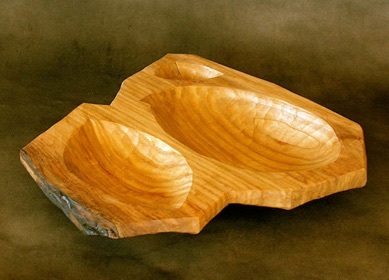 I still have a few wide planks that are available for very special multi-hollow bowl commissions. Each bowl has been signed with the initials DL and the year 07. On the earlier bowls I used double v-cut engraving for both initials and the year. Later I switched to single cut kolrossing engraving (a wood decorating technique from Norway and other northern European countries. On the kolrossing signatures the dye is finely ground coffee. Developing a system for numbering the bowls was a challenge. I wanted to use a method that is attractive, permanent, unique and easy to understand. I eventually came up with a system of insetting copper “studs” into the bottom. These studs are actually cut copper tacks, with the heads snipped off. The number of studs indicates the bowl number. They are set in clusters of up to 5 studs. They are slightly inset below the bottom surface, so that they cannot scratch a table top. The assigned numbers for these bowls are in the approximate order of production. Numbers 1-3 and 10-13 are in order. Numbers 4-9 may be slightly altered. 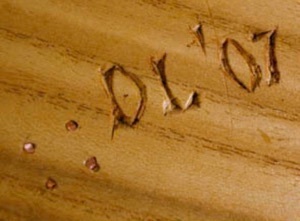 At the time I had not developed the copper tack numbering system that is found along with the signature on the bottom. * I have made one rustic Windsor, Version 7 of my Hearth Chair design, from this stash of sassafras (see photo at left). 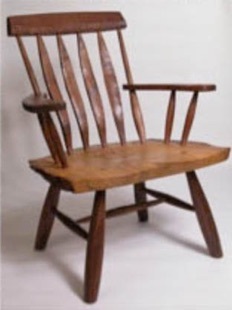 This chair was made for a Country Workshops faculty exhibit at the Folk Art Center of the Southern Highland Craft Guild in Asheville, North Carolina. It is now in the permanent collection of the Guild.